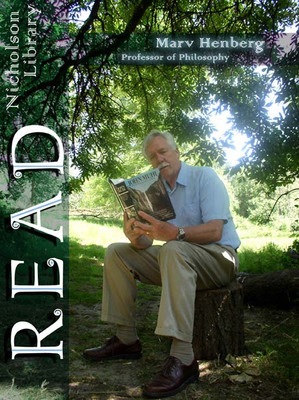 Marv Henberg, Professor of Philosophy, reading The Eight Wilderness Discovery Books, by John Muir. Terry, Paula and Nicholson Library Staff, "Marv Henberg READ Poster" (2008). READ Poster Gallery. Image. Submission 31.